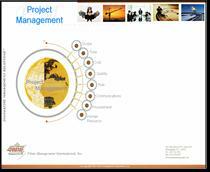 Click here to view our Project Management Brochure (.pdf file). Prime Management International understands the complex, competitive nature of today's demanding work environment: work must be performed more quickly, efficiently, and cost-effectively, with fewer resources than ever before; customers demand higher quality and faster delivery cycles; and executives adopt a zero tolerance for failure. As projects increasingly form the very backbone of successful organizations, more and more key decision makers are concluding that by adopting project management practices, their organizations are beginning to make real and tangible gains. These organizations have found that their projects are completed on time and within budget, and commitments to clients are met. Project management has increased the competitive advantage of many organizations through a reduction in the cost of managing projects, more accurate planning, and faster project delivery. Prime Management can help your organization establish structures and systems for the effective and successful management of multiple projects, and face the challenges of a highly competitive business environment. Our broad scope of products and services gives us the leading edge in helping individuals, teams, and organizations achieve their performance goals. Prime Management has designed its skill-building training programs, resources, tools, and consulting materials based on PMI’s Guide to the Project Management Body of Knowledge (PMBOK®), and our experienced instructors, facilitators, and consultants are available to help project managers and project teams translate concepts learned in the classroom into real project practice, to foster enterprise-wide project results.